I almost didn't even give this grape smoothie recipe a try. 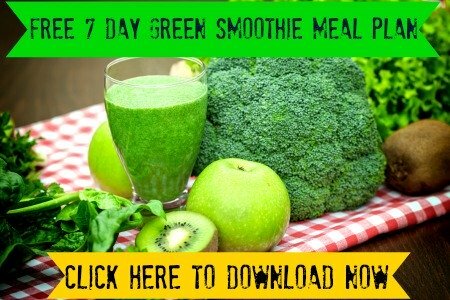 When I first heard about the 21 Day Green Smoothie Challenge I loved the idea, but I was concerned I wouldn’t have enough time or the motivation to stick with it. It didn’t help that I was out of town this past weekend and therefore away from my normal kitchen and ingredients. And yesterday I spent nearly 8 hours driving home (from San Francisco to Orange County). But today I bit the bullet and decided: No More Excuses! I am going to stick with it and I am excited to see the results! I’m hoping for a transformation of my health, at least on some level, by getting more vitamin-rich fruits, green veggies, and superfoods in my diet each and every day. To keep myself motivated I am committed to share my progress on here. I won’t necessarily write a full new article like this every single day but at the very least I will share progress notes and photos on my Facebook Page and Instagram, so be sure to follow along! So there’s one small problem. The challenge actually started two days ago, on November 1st, while I was still out of town. Today is Monday November 3rd. And I got home from work around 8 PM and still hadn’t even looked at the week’s shopping list yet. Plus, I had a bit of a stomachache from something I ate for lunch (eating out seems to be the culprit) so I wasn’t even sure if I could muster up the energy to go to the store and make something. But I did it anyways, and boy am I glad I did! The massive green smoothie I ended up with (which was delicious by the way) had a major detox effect on me to help counteract whatever bad thing I had for lunch. (Note to self: just because it’s a veggie burger does not necessarily mean it’s good for me). So I made the first smoothie recipe today, and I am determined to make 2 smoothies a day for the next 2 days in order to catch up with the rest of the group to be on track for the group challenge. Maybe that’s cheating, but if it means two green smoothies a day, it’s cheating in a good way right? I’m not going to go into too much detail about the grape smoothie recipe itself here because that’s the job of the Blender Babes. If you’re curious for exact measurements and details, join in on the next challenge! Or you can just do what I normally do and eyeball the smoothie ingredient ratios…you’ll find this works if you already have some experience making smoothies. Bananas – I followed the recipe to the T and used 2 full medium-sized bananas. I usually don’t use that many in my green smoothie recipes because I like to watch my sugar consumption. Chia Seeds – The original recipe says they’re optional, however I throw a bit of chia seeds into most of the smoothies I make for the extra Omega 3 healthy fat benefits (and some extra protein too). Ice – To make it into a smoothie…cool, refreshing and easy to drink. 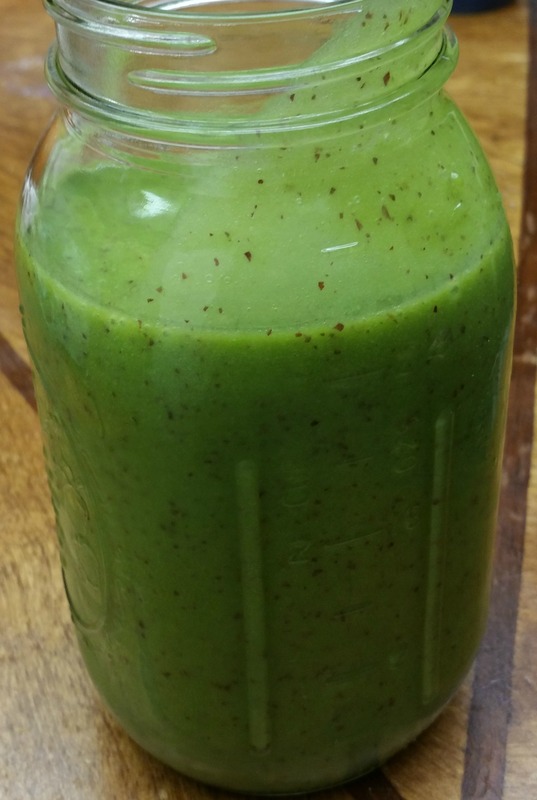 Below is a quick video that shows my exact method for making this smoothie recipe. But first…you may have noticed something funny about these smoothie ingredients: there’s no liquid. I don't normally follow smoothie recipes, but this time I measured out all the ingredients for this recipe before I even turned on the camera. And right before I pushed play, I noticed I hadn’t measured out any liquid and had no clue how much water to use. So I checked the recipe again…didn’t see any water mentioned. I wondered if I wasn’t reading it right so I triple checked it. And even then, I was still apprehensive about turning on the blender. But in the back of my mind was really the fear that I could explode my Vitamix on camera…not such a good idea. So I was pleasantly surprised when I turned on the blender as usual, and with the aid of lifesaving tamper, turned a bunch of solids into a liquid! In about 30 seconds flat! A major reason for why that works is the grapes. They’re a naturally liquidy fruit. (I don’t know if “liquidy” is really a word or if I just invented it). 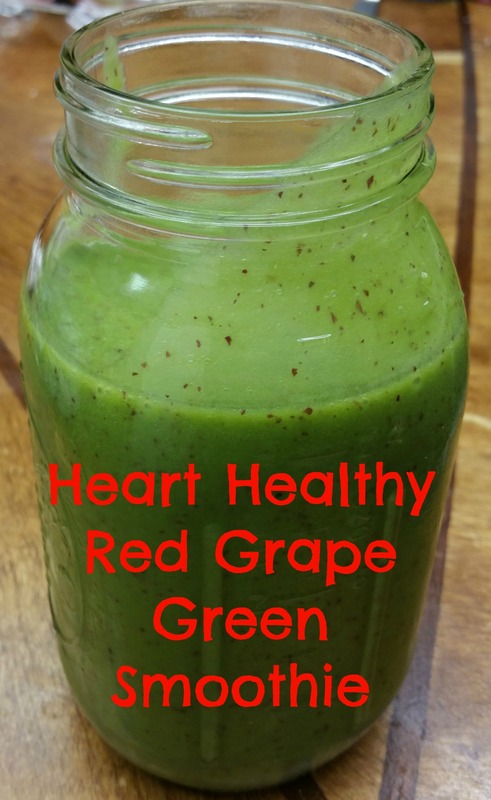 In fact, I usually don’t like using grapes in smoothies because they usually cause a strange texture, and I cringed when I first saw this recipe. But the trick here is to use the grapes and actual ice cubes (not frozen fruit) to tap into the natural liquid hidden within these two solids. The end result? 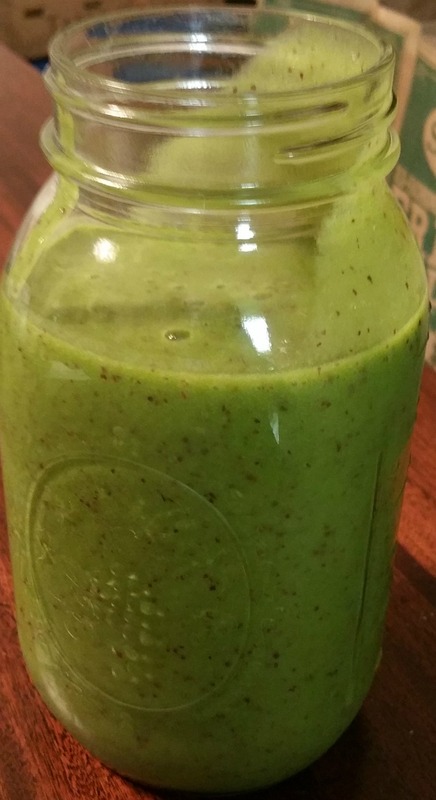 An extremely rich and OH SO GOOD smoothie with maximum vitamins and nutrients, since it’s not watered down at all with any liquid that wasn’t already inside the solid ingredients. Don’t even try to do this in a standard low-powered blender. This particular recipe only works in a high-powered blender like the Vitamix. If you do have a standard blender like Oster or Ninja, you can try this recipe using 2 cups water (add more if it doesn’t blend). Honestly, even if you do add water, you will likely have trouble blending so much spinach in one of those blenders. 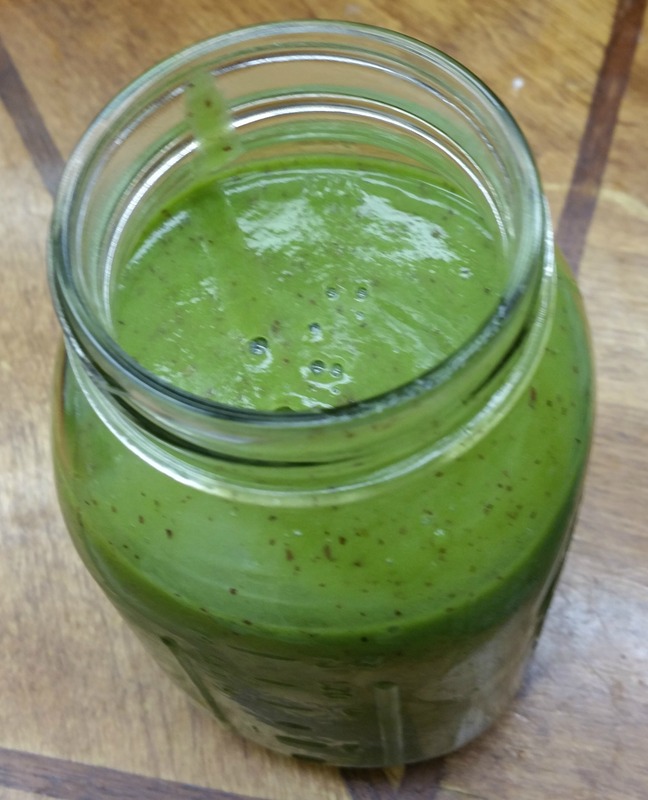 This actually made 1 quart of green smoothie (4 cups)…which I promptly devoured in 5 minutes flat. I used this grape smoothie as a substitute for my dinner for the night (around 10 pm..by the time I got done with shopping and all). And I couldn’t have felt better after.